Both inventive and familiar at the same time, At The Edge Of Light combines together what we all love about Steve Hackett: great melodies, interesting orchestration, and fantastic guitar work. Guitar virtuoso, progressive rock instrumentalist, classical guitarist, producer, composer, currently most relevant member of Genesis. These are all terms that describe Steve Hackett, but they don’t define him. Ever since the seminal Voyage Of The Acolyte, Hackett has cultivated his own sound, while, at the same time, never standing still. Unlike some of his contemporaries, Hackett is now producing more music than ever before. At The Edge Of Light comes at us less than two years since his last studio album, The Night Siren, in 2017. What we get here is a further extension of modern-era Hackett. The instrumental opener, “Fallen Walls And Pedestals”, pulls no punches. With its heavy as hell eastern riffing and angular solo from the man himself, it sets a fantastic, bombastic tone for the album. As usual for Hackett, it shows only one side of what is a multi-faceted release. With “Beasts In Our Time”, the first track to feature vocals, I am immediately reminded of Lake/Sinfield era King Crimson. The ‘English’ sounding melodies are broken up with a soulful tenor sax solo. It’s a track that takes its time, with no need to rush. The dark key changes and strings give it a slightly disturbing cinematic feeling, before breaking out into a heavy shuffle, very at odds with the rest of the track. It works and just sounds fun. This retro and neo-prog approach appears throughout the album (“These Golden Wings”, “Under The Eye Of The Sun”). These tracks satisfy my need to hear ‘classic’ Hackett, but are not derivative. His never ending ability to pen a great melody shine on each one, and even these ‘commercial’ tracks are interspersed with interesting key changes, surprise instrumentation (Didgeridoo!) and even classical passages. Sure, it’s cheese factor 11 at times, but I don’t think Hackett cares one bit, and nor should he. Hackett has frequently taken inspiration from music from all over the world and, in his own words, ‘[At The Edge Of Light] feels. . . like I have finally connected properly to world music.‘ These influences are scattered throughout the album and, for the most part, feel natural and fitting. “Shadow And Flame” is a standout example, featuring a sitar solo and tabla backing, which are cleverly integrated with the traditional band. It evokes Led Zeppelin‘s “Kashmir” at times, with the pounding drums and eastern-tinged strings. To be honest, it’s hard to avoid that comparison with any heavy ‘eastern’ sounding track, so that’s not a criticism. It’s only let down by the premature fade over the soloing at the end. This leaves the track feeling unfinished, especially compared to the longer epics that surround it. It’s always hard for a rock album to integrate world music successfully. It can easily come across sounding appropriated or obvious, unless the artist has a genuine connection with the styles in question. Hackett has plainly down his research, and also employed the ‘real deal’ when it comes to the guest musicians. Although some of these world music references are a little too ‘on the nose’ (the didgeridoo for example), it mostly works as part of the album as a whole. Apart from a few falls here and there, Hackett has created an album that covers a hugely diverse range of styles and instrumentation, while still managing to sound like a coherent whole. How does he manage this? A few ways. His ability to focus on the melody, no matter the style, is key. As a listener, I’m never left ‘up the creek without a paddle’ so to speak. There’s always a great melody to latch on to and pull me along for the journey. Another reason why this diverse collection of songs works well is likely to do with the amazing line up of musicians. From world musician masters such as Sheema Mukherjee (sitar) and Malik Mansurov (tar) to the prog stalwarts of Nick D’Virgillio and Jonas Reingold, this blend makes everything work as a whole. Some of the standout tracks are ones that don’t fit the usual mold. “Underground Railroad” is a personal favorite of mine. Starting with a heavy gospel influence (provided by the amazingly talented Durga and Loreley McBroom) it moves into a raw ZZ Top style rocker, even including a symphonic middle section. It shouldn’t work, but it does, majestically so. It probably goes without saying that Hackett’s guitar work is as good as it ever was. His style is so distinctive and always a joy to listen to. The soaring melodic work is present throughout (“Hungry Years”, “Peace”) as is the signature angular and technical displays. The additional heavy riffing here and there are, personally, welcome. Of course, Hackett’s classical influences are present and correct. “Decent” is a Bolero-esque tense affair, combining orchestral and ambient effects nicely. “Conflict” is another cinematic instrumental interlude that kept me on my toes. Although these are of high quality, I felt they seemed like an afterthought. This might be partly due to them being relegated towards the end of the album. At The Edge Of Light feels like a statement, which is great, considering what he was looking to create: ‘What I was aiming to do here, as I always do, was to make music that I don’t hear anywhere else.’ He’s certainly achieved that. Will it appeal to non-Hackett fans? I reckon probably not. As always, he doesn’t care about that and has just got on with it. His ability to self select only the highest quality ideas is ever-present. This avoids the ‘everything but the kitchen sink’ feeling that it could’ve easily become. As is the way with any Steve Hackett album, expect the unexpected. 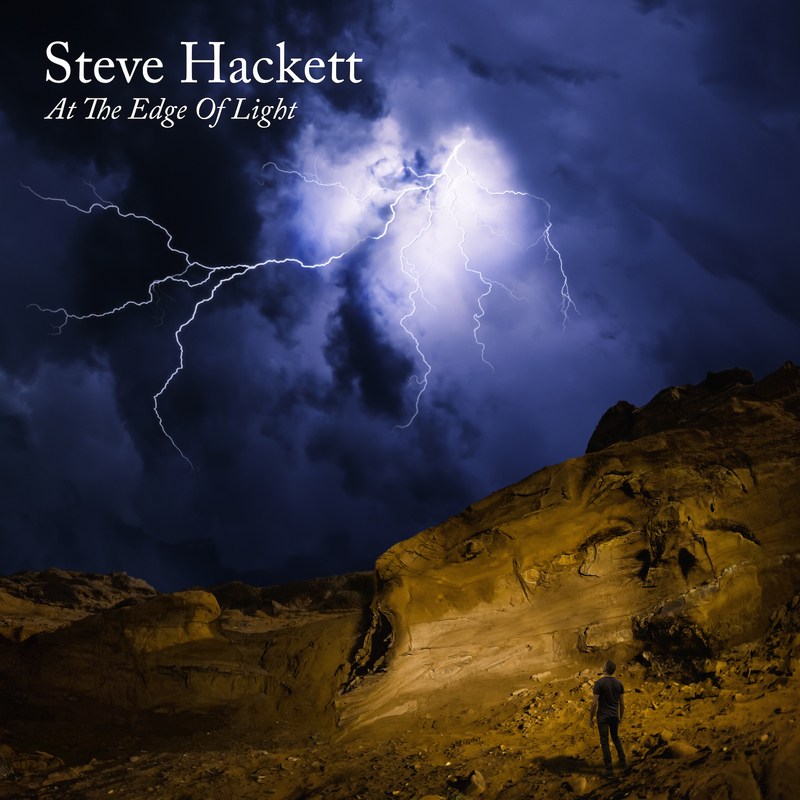 At The Edge Of Light is another successful fusion of a myriad of styles, woven together by Hackett’s inimitable guitar style and his ability to write, and never lose sight of, a great melody.